Me and Mr. Peabody are in the WABAC machine for this recipe – if it can be called a recipe at all. This is another in a long line of things I made while in my vegetarian phase – if you can call a decade a phase, but that I continue to make because it is just so damn good. I have been thinking of making this for a while now. It uses things that I don’t tend to have on hand, red onion and orange juice. It is a mix of a lot of strange things, and I could not tell you, have no idea, where the original recipe came from. But somehow all these weird things come together and if I am honest, which I can occasionally be, it is the red onion and orange juice that totally make this for me. Worth that trip to the grocery store – yep. Every time. Handful of minced flat-leafed parsley – not totally required really – but pretty much. Heat orange juice in a saucepan until simmering gently. Add raisins. And let the raisins enjoy themselves. Toast the nuts in a small pan, stirring often until just fragrant. Coarsely chop. Place diced red onion in a heat proof glass dish with just enough water to cover. Heat in microwave for about two minutes. Let sit for a few minutes, then drain. Add a splash of vinegar, which ever kind you prefer to the onions. Turn up heat to a nice simmer on the orange juice, add the couscous with a tablespoon of olive oil. Mix, cover and let sit off heat to steam. Fluff with a fork. Add scallions, red onion, nuts, and parsley and mix to combine. Notes: I like regular small couscous. 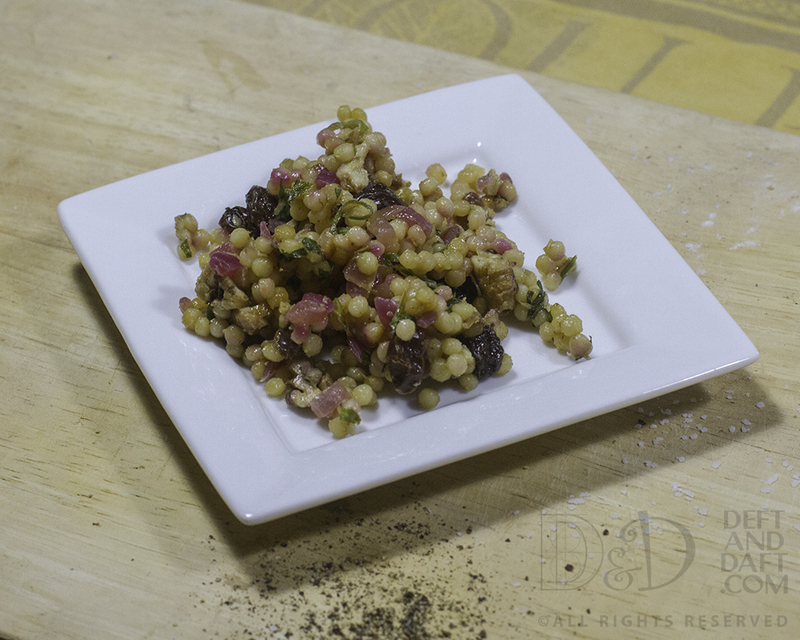 I tried it this time with “pearl” couscous, which I think is just a bit too big, too toothy – if that makes any sense, so I went back for the tiny couscous and made it again. Yep – that is what I remember – fluffy couscous with all sorts of weird flavors that really work together. Let it sit over night and it gets even better – no joke. Amazing, flavorful, and really great for breakfast – but I am the girl that likes cold Pad Thai for breakfast too. There it is.